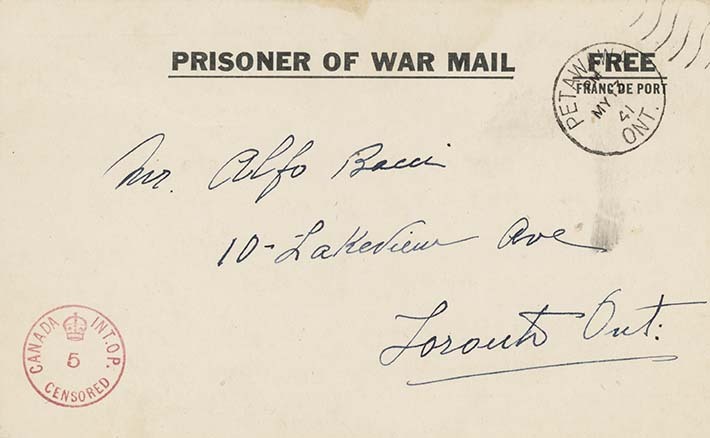 Postcard from Ruggero Bacci, written in Italian, to his son Alfo Bacci, May 12, 1941. In this postcard to his youngest son Alfo, Bacci notes that he was pleased to hear of his son's fishing trip. He warns him to be careful when fishing. He also notes he's read about his exam results. He asks his sons to behave with honour and to help their mother. Bacci was interned for almost three years. In his absence, his wife Erminia (Minnie) suffered a serious nervous breakdown and was hospitalized at length. Bacci's oldest son Aldo was forced to quit high school to help support the family. When his father was released and returned home, Aldo received notice that he was conscripted into the Canadian Army; however, he did not serve overseas. This document forms part of a collection of documents and other materials on loan by the Bacci family.